David Hall has all the details on a Getintothis exclusive, as the highly-regarded newcomers announce a Club Evol show. Hotly-tipped Stockport-based youngsters Blossoms have nailed on a Club Evol date at the Liverpool O2 Academy next year. They will follow up a support slot with The Libertines – when their tour visits Manchester Arena in January – with a Merseyside show in the Spring. The five-piece returns following an impressive past showing at the O2 Academy and a string of North West dates which have seen Blossoms build a fanbase enviable to other acts at a similar stage in their development. 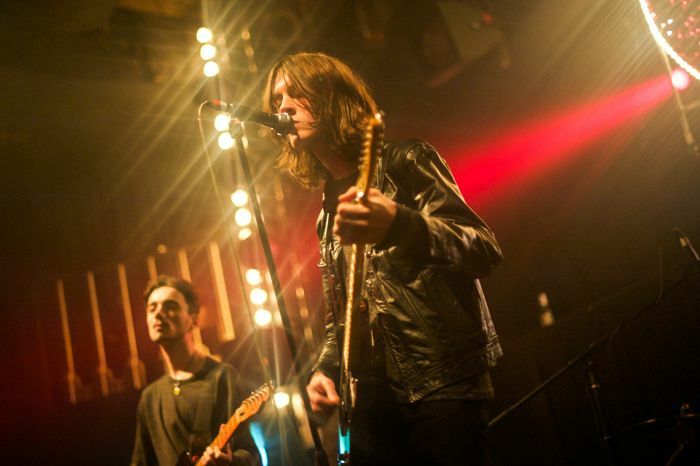 A band to keep an eye on in 2016, Blossoms join the impressive new year line-up hosted by Club Evol, featuring gigs from Cage the Elephant, Battles and 65daysofstatic. Blossoms’ accessible but eclectic sound matches swirls of psychedelic keyboards with the kind of radio-ready guitar chimes, all of which could see their current buzz band status translating into an indie-pop force to be reckoned with in a year’s time. Support will come from a well-matched pick of local bands, opening with the sweet, summery shimmer of Warrington’s Viola Beach. Getintothis’ favourite Scouse psych-mongers The Vryll Society meanwhile have obviously impressed Blossoms greatly. The Deltasonic-signed mob are lending support not only at Blossoms’ Liverpool gig (for the second time in under twelve months, no less) but also joining them for a nationwide jaunt. Blossoms play Liverpool O2 Academy on Friday March 25, with support from The Vryll Society and Viola Beach. Tickets are on sale from 9am, Wednesday December 23.